We have been showing you pictures of our environments AKA biomes and they are basically what kickstarted all the mad interest in Planet Nomads, before we even had much of a game. It was back in April, some 8 months ago. Time flies, eh? 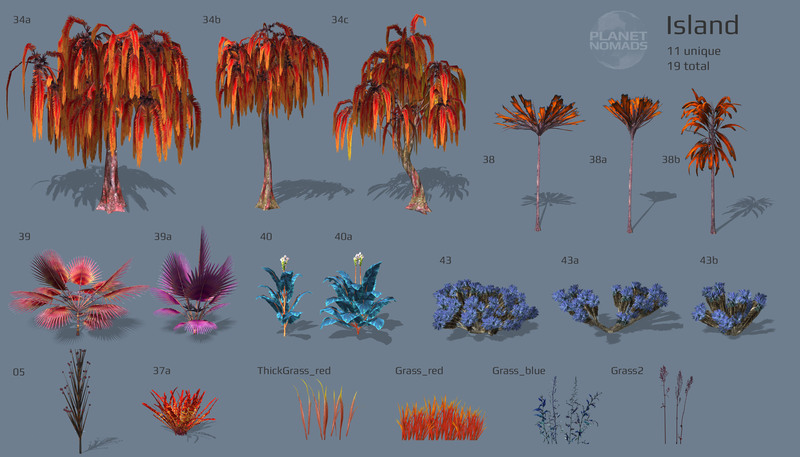 If you ever wondered how the biomes are made, let me introduce you to Jacob, a Craneballs co-founder and Art Director for Planet Nomads. Jacob has agreed to uncover a bit of his creative process today. Before we get to details, can you describe your personal relationship to Planet Nomads? Long before Planet Nomads, I carried this idea in my head about an astronaut stranded on a hostile planet, trying to uncover its mysteries, a survival adventure game with strong narration elements. 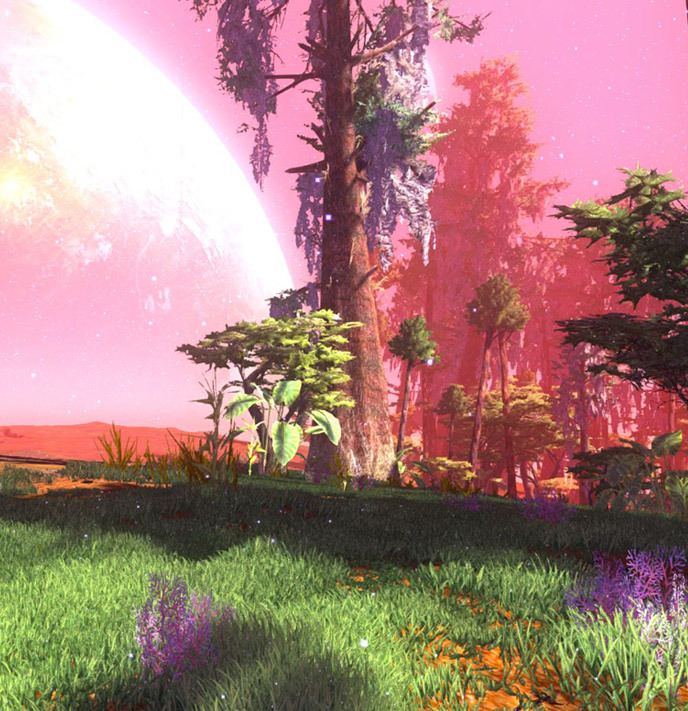 Planet Nomads is different, a sci-fi sandbox game with building and crafting, yet it can create a similarly powerful atmosphere with its visuals and progression through technology. It gets even better with the use of procedural terrain generation, as I'm no longer limited to a single planet. So, what's your main role in Planet Nomads development? 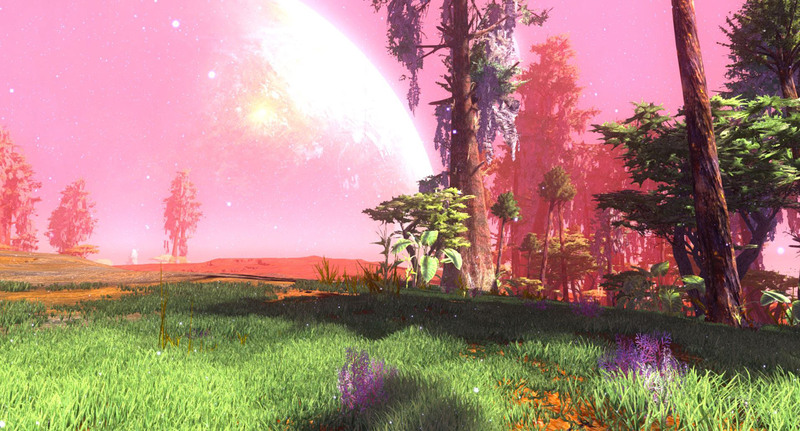 I create the environments for Planet Nomads from the graphical standpoint. I come up with their visual appearance and then create the art - model the trees, bushes, rocks and other objects, decide their shapes and colors, create textures for them. You say "come up"... how does one come up with a whole environment? OK. 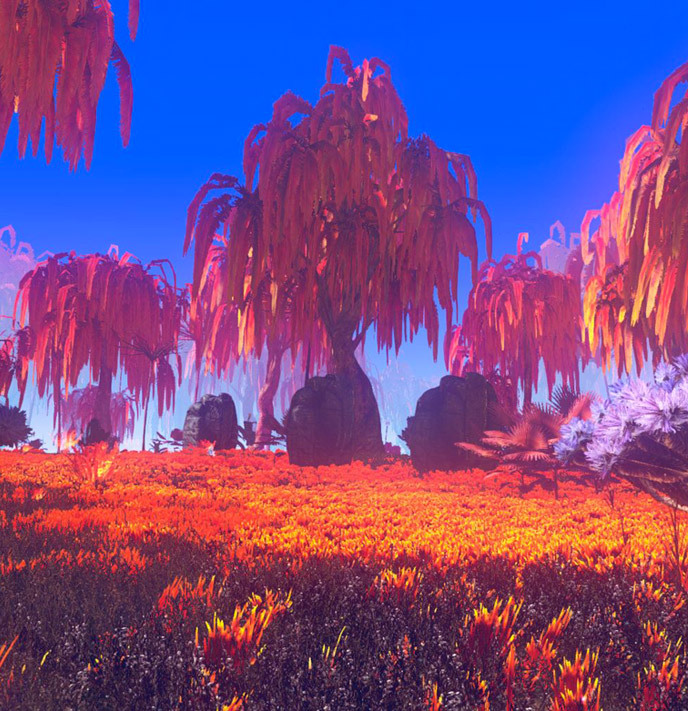 Trees and shrubs are surely important, but that's not what makes the general look of a biome. Actually they do set the appearance of the whole biome. If you look closely at the pictures of biomes you will clearly see that. 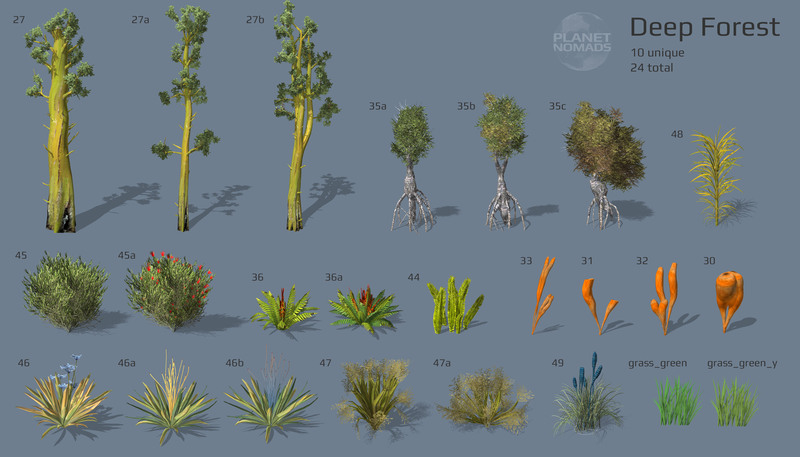 Check the list of vegetation for the island biome, deep forest or green forest. 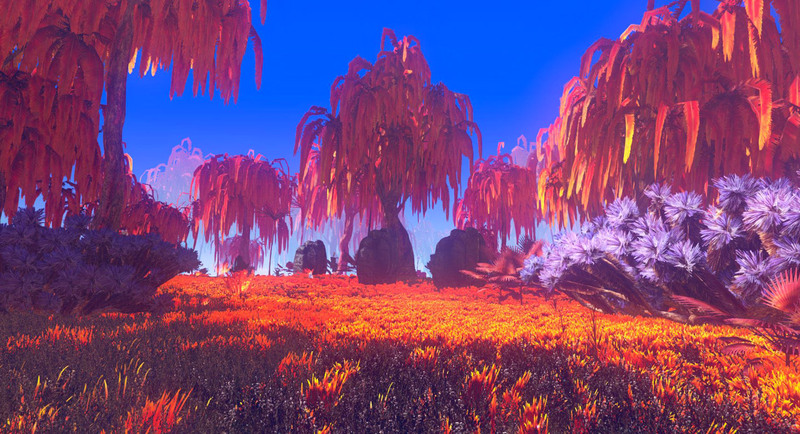 Now compare them with the pictures of finalized biomes, you see what I mean? I see that now. So how do you come up with different types of biomes then? Well I do have a general idea of what I'm trying to accomplish. I will begin with imagining the climate zone for the biome. For instance a jungle biome means there's a lot of sun, humidity and fertile land, an ideal environment for plants. But paradoxically that also brings about fierce competition with every plant fighting for its place. I am not a botanist, but I try to imagine the biomes as living organisms rather than rigid structures, which leads my decisions further down the road. Climate zone is not only about temperatures; tropical zone on Earth is different in Africa and Indonesia, generally there are deserts in one and rain forests in the other. Not every biome goes to these extremes of course, so we are aiming at natural transitions between biome types. Let's talk about your use of color in biomes. Obviously, rules are meant to be broken, so with a careful selection of small details here and there, I can digress from the basic color palette and it will still work fine. Just like in nature. OK, so evolution, color palette and all, that's nice, but there has to be some... artistic inspiration, influences? Besides nature itself and art in general, there is one thing I remember clearly. When I was thirteen, I got my hands on the art collection book of Tim White called Chiaroscuro. Tim White has designed book covers for sci-fi authors that include Arthur C. Clarke or Frank Herbert. He used physical airbrush technique (Photoshop was a not a thing back then, it was the 70s-80s). I got the book in the 90s and without much exaggeration I can say the pictures I saw inside the book changed my life. I had never seen anything like that before. For me those pictures meant imagination could be brought to life and started me on my way to become a professional graphic designer. 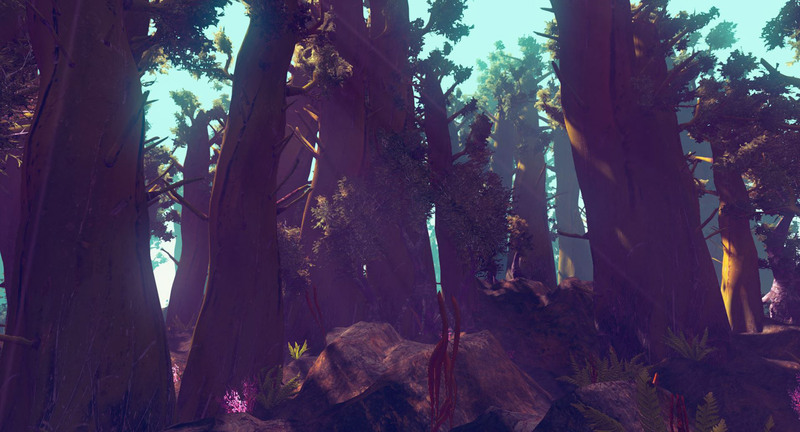 Looking at the latest biomes, despite their unusual color-palette, they still feel familiar. Are you planning to have something more alien for us? Like the stuff from Avatar? Avatar still feels very Earth-like, although Pandora's nightlife was a fascinating spectacle. What I have in mind for truly alien-looking planets will be radically different. But I wanted to start with familiar looking biomes first, in the hopes of not scaring people off, so to speak. But if they are into curious looking worlds, I can assure them good stuff is coming. 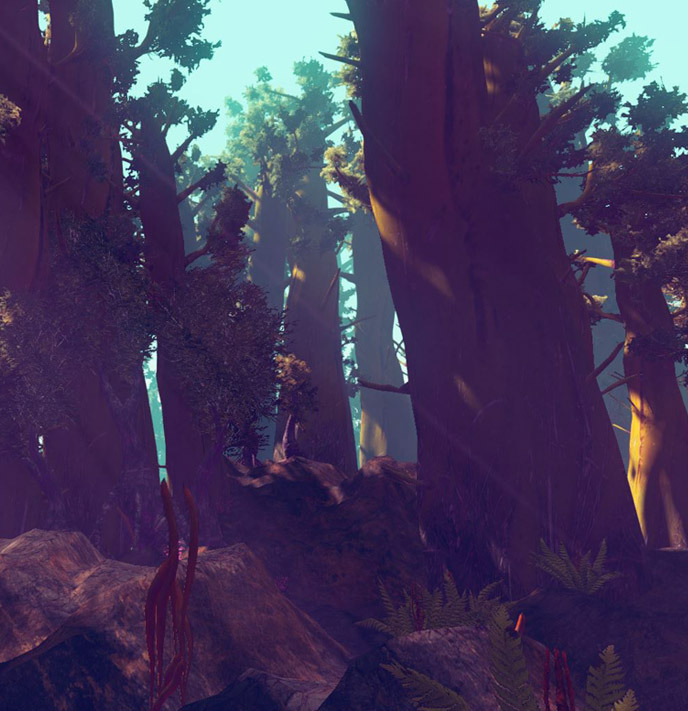 Thanks for sharing your process and teasing future biomes! Below are the latest biomes by Jacob. The last one is already implemented in our Sandy Engine, the other two are on their way there as well.